TKCalendarSelectionModeNode - No selection is allowed. TKCalendarSelectionModeSingle - A single date can be selected. 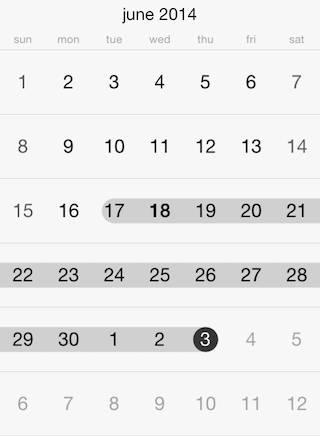 TKCalendarSelectionModeMultiple - Different dates can be selected by tapping on them. A second tap will deselect the date. TKCalendarSelectionModeRange - A range between two dates on the same page can be selected. Use the selectedDate property to get or set the currently selected date in TKCalendar when the single selection mode is used. Use the selectedDates property to get or set the selected dates when multiple selection mode is selected. The selectedDatesRange property is used to store the date range when this selection option is used.